Tuesday, May 14, 7:30-9:00 p.m. 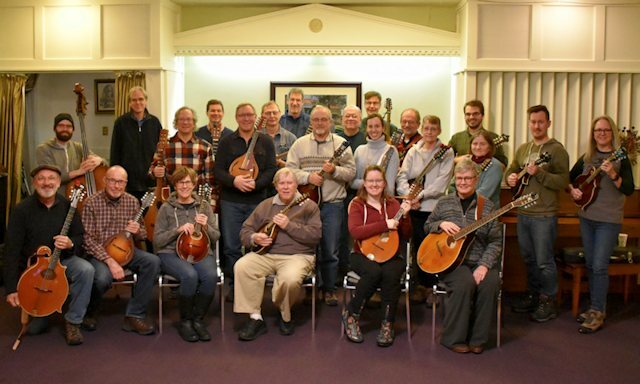 The Minnesota Mandolin Orchestra was formed in 1991 to preserve and foster the enjoyment of mandolin music. We have about 25 musicians, playing mandolin, mandola, mandocello, guitar, and bass. Our repertoire includes old and new compositions for mandolin ensembles, transcriptions of classical music, and arrangements of popular tunes. New players are always welcome. You can write to Lon Hendricks for more information, or just come to any rehearsal to see if you like what we do.